Tom Bingham (1933-2010) was the 'greatest judge of our time' (The Guardian), a towering figure in modern British public life who championed the rule of law and human rights inside and outside the courtroom. 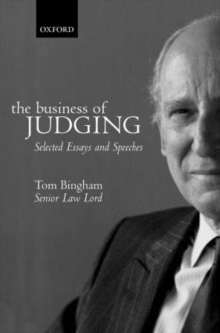 The Business of Judging collects Bingham's most important writings during his period in judicial office before the House of Lords. The papers collected here offer Bingham's views on a wide range of issues, ranging from the ethics of judging to the role of law in a diverse society. They include his reflections on the main contours of English public and criminal law, and his early work on the incorporation of the European Convention on Human Rights and reforming the constitution. Written in the accessible style that made The Rule of Law (2010) a popular success, the book will be essential reading for all those working in law, and an engaging inroad to understanding the role of the law and courts in public life for the general reader.